This meal was actually put together with all the leftover ingredients from other meals. I got the macaroni for American Goulash and bought kale for the soup. The bag of macaroni was so big and so was the kale bunch. I knew the macaroni could be stored but I really didn’t want the kale to go to waste, so I searched around and found this kale salad. I decided to give it a try. It was so good that I will definitely make it again. You can actually make this salad in advance especially if you don’t have baby kale. The dressing will marinate the kale a little making it less raw tasting by bringing out the sweetness of the kale. 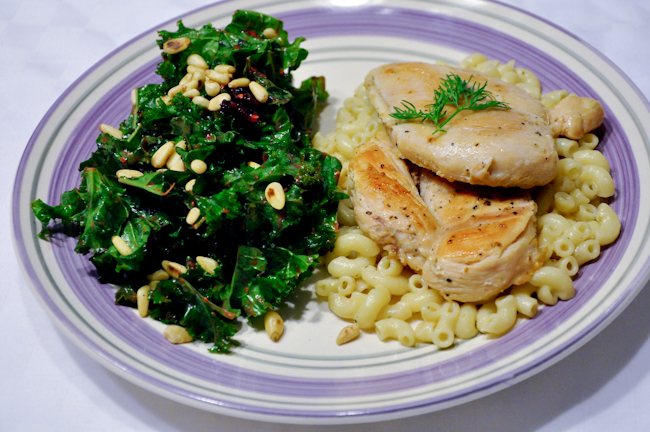 You can also season the chicken in advance and precook the macaroni to ensure a fast dinner!